I remember sitting in a cold, cavernous cinema with one of my aunts and one of my brothers when the first refrains of John Williams’s score for A New Hope thundered out across the theatre. Speechless I sat, wide-eyed and rapt, and watched a film that helped put my feet on the path to becoming a storyteller. It was 1977 and I was 10 years old, going on 11. And I wanted to be a Jedi Knight. Jedi. Knight. The name strikes a chord, evocative of bravery, mystic powers, chivalry, justice . . . and lightsabers. A modern telling of a classic role, the hero with the magic sword, fueled by honour, virtue and the desire to do right in the world. Here were space-faring versions of Merlin and Gandalf in old Obi-Wan Kenobi, the mentor and guardian. There were glimpses of Galahad, and other young idealists in the destiny-driven Luke. And the antagonists! Who could forget the ominous shadow of Darth Vader, broken and driven to terrible purpose? Or the evil of Grand Moff Tarkin, so lean it seemed as if all the good had been leeched out of him. What of the anonymous facelessness of the stormtroopers, or the crushing might of the Star Destroyers, or the Death Star? These were enemies that seemed so much larger than life, so insurmountable, that they called for nothing less than a dauntless hero to topple them. There was an innocent and idealistic part of me that identified with Luke Skywalker and Obi-Wan Kenobi, though I leaned more towards Obi Wan as I grew older. That idealistic part of me still exists to a great degree, as does the somewhat quixotic nature that goes with it. I identify more with classic heroes, rather than the anti-heroes that have become quite popular in speculative fiction in the last decade or so. That said, I do like my heroes flawed, but classic, and it is the upright though flawed characters that inspire me most. Characters with a cause to fight for, the strength to fight, and the integrity to fight for, or dedicate themselves to, something bigger than themselves. They make mistakes. They fail. They fall, but they pick themselves back up again because it’s in their nature not to surrender, and because others need them. Along the way they pay a terrible, personal price for doing the right thing, but they continue to do the right thing regardless of what it costs them. In Episodes IV, V, and VI we have Luke, and Obi-Wan—and the tales told by Yoda—that give us a glimpse of these mystic knights errant. We see them more clearly in Episodes I, II, and III, and come to understand the sacrifices they make, and the constant danger they place themselves in. 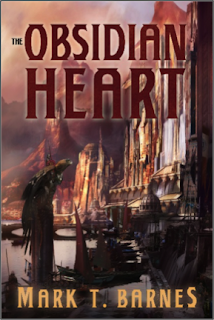 When I did the initial world-building and plotting for The Echoes of Empire series, the idea of conflicted heroes who fought against impossible odds lay at the kernel of it all. Indris, my protagonist, is representative of force and thought, both warrior and wizard. He is a member of the Sēq Order of Scholars, themselves a much diminished order of mystic knights, leaders, and historians, fallen from glory through their own hubris. Indris, like Obi-Wan, Odysseus, and many heroes of the classic mould, has a background spotted with his triumphs and failures, joys and sorrows. He is burdened by guilt and secrets that remind him not only of why he is what he is, but why he must continue to be so. The Jedi Knights are entrenched in our mythology now, and still hold a special place for me. I watch the Star Wars saga every year, the way I do The Lord of the Rings, and read Dune. There are some stories that stick with you. If somebody asked me today whether I’d still want to be a Jedi Knight, I’d have to say yes. But then again, I’m a sucker for heroes in their imperfect glory. It’s why I write them. Mark Barnes lives in Sydney, Australia. He is the author of the epic fantasy Echoes of Empire series, published by 47North. 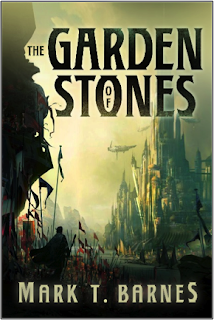 The series includes The Garden of Stones and The Obsidian Heart. The Pillars of Sand is the third part of the series, and due for release in May 2014. You can find out more at www.marktbarnes.com, his Facebook page at www.facebook.com/marktbarnes.author, or follow Mark on Twitter at @MarkTBarnes. My first Conan story — and free Overdraft!